DHEA is short for Dehydroepiandrosterone. It is the most abundant hormone produced by the adrenal glands. In the body, it is converted to testosterone and estrogen. Production peaks in your early 20’s, and declines about 10% every 10 years. This means that those in their 80’s produce only 10 - 20% as much as they did in their 20’s. • Increases energy and strength. There have been studies to substantiate this increase as well. One study examined the effects of a 50 mg. daily dose on both men and women who were over the age of 50. This dosage was enough to increase DHEA levels to that of a 24 year old in only 2 weeks of supplementation. A follow-up study was done where participants consumed 100 mg. of DHEA before sleep. This not only raised DHEA levels but boosted immune function, increased gains in lean body mass, increased strength, and decreased bodyfat. The human body produces very little DHEA until about the age of seven, when production soars. It peaks in the mid-20s and starts to decline in the early 30s. By the mid-70s, DHEA production has dropped by about 80-90%. At all ages, DHEA levels are slightly higher in men than women. The optimum DHEA level in a healthy adult is 750-1,250 milligrams per deciliter of blood (mg/dL) for men and 550-980 mg/dL for women. Have been taking it for a year now and is a excellent product at a reasonable price. I can really tell the difference in how I feel and my skin has been tightening up. I love this product and have had no side effects! 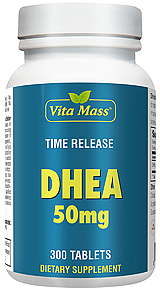 I've been using DHEA for quite some time; it works! Suggested Usage: For adults, take one (1) tablet daily .